Latrobe Music is a community organisation bringing exciting music workshops and events to the Gippsland and the Latrobe Valley. It’s run by singer-songwriter Phillip Chalker from Traralgon. All workshops and events are led by experienced artists and are open to all ages and abilities. You can have lessons with Phillip at his premises or at your own home. Group sessions are also an option. If you’re too far away, you might consider lessons via Skype or other online hook ups. Instrument basics, chords and strumming techniques. You will be quickly playing simple songs such as those with two chords and able progress to more difficult tunes. One of my specialties is getting beginners a solid start so they are quickly able to play in a group with others. For those past the beginner stage, lessons can provide you with additional advanced technical skills. There’s more information on the Lessons page. What do you need to get started? Just your own instrument and tuner and the desire to play! Looking for something a bit different that will teach you new music skills? You can find information on the Latrobe Music Events and workshops page. Across the year Latrobe Music provides a range of different music experiences with many different instruments and highly experienced teachers. 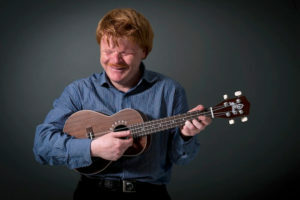 Latrobe Music can also lead ukulele workshops for complete beginners. These workshops can be run at local community centres, neighbourhood houses, special events, festivals, at schools or for scout groups. Phillip has performed at community events, private functions, festivals, in day programs, and at schools and aged care facilities, either as a solo performer or in a group. Disco music and music DJ’ing are options that you can add to fit in with the nature of your event. You can contact us in advance to discuss how these options could work for your event.and audience. More details are at our Live Performances page.